Though the rain is finally ending the scorching heat along with it the risk of getting sick arises for the kids as well as the adults. Especially in the case of kids, special attention is required. a lot needs to be taken care of while ensuring that your child does not fall sick. Humidity, flooded roads, mosquitoes, diseases, dirty and unhygienic environments can be the reasons for bad health. 1. Make your child wash their hands often: A simple way to improve immunity and keep the infections at a bay is to wash the hands frequently. 2. Increase the consumption of Vitamin-C rich foods: The vitamin that helps to maintain the space between the cells in the body and prevents infections from getting into the body is Vitamin C. Make sure that your kids consume a lot of fruits rich in Vitamin C.
3. Keep the juices away from your kid’s diet: Make sure the vitamins required for a healthy growth of your child come from whole fruits and not juices. The juices and the ice which is used in the juices are likely to have lots of germs and therefore might cause infections. 4. Drink boiled water: On an important factor that needs to be taken care of during monsoon is to drink clean water. Contaminated water is the source of infecting germs. So, let your child drink clean and germ-free water. 5. Avoid junk food in rainy season: Food cooked at roadside stalls may force your child to eat. So, it is best to avoid such food because the food they serve might cause diarrhea and vomiting. 6. Always wear dry shoes and socks: Children often ignore their wet feet and keep playing in wet socks and shoes unless they are told to change. Wet socks and shoes make children prone to infections because they are a constant source of cold. Keep children at home if they are sick: Infections that children get during the monsoons are viral infections which spread fast from one child to another. It is, therefore, the responsibility of every parent to keep their children away from other children if they happen to be sick. These basic tips and tricks can keep your child away from infections and other diseases. 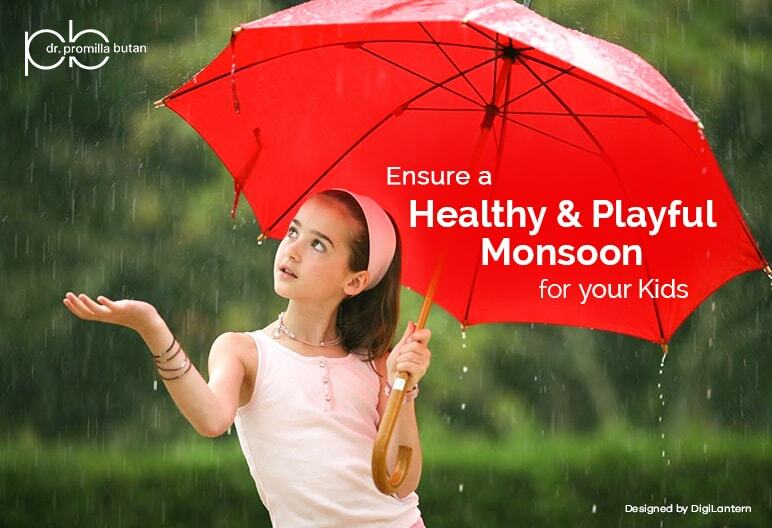 For further information, contact Dr. Promilla Butani or log on to www.drpromillabutani.com and let your kids enjoy the monsoon season with a constant smile on their face. Previous Previous post: Why should you be using social media if your teenage kid is?